Affordable Accoutrements: Time Capsule Table! We're in the sunroom on a cloudy day. No sunlight streaming across the table, but I don't mind. We desperately need rain. The dishes are "Spray" by Blue Ridge. The earliest they could have been produced would have been 1948, when the company's "pie crust" shape was introduced. Blue Ridge had ceased operating by 1957. The glassware is Libbey/Rock Sharpe (3005 stem). I collect Rock Sharpe by shape without regard to which etched pattern I'm buying. I actually prefer mixing the designs for table settings. It adds variety and interest. A closer view. Note the rounded edge that minimizes the liklihood of chipping the rim. I'm using restaurant napkins today. They're great for everyday use, because they launder so beautifully. I folded them in half, in half again, and then into thirds. I rolled under the top edge and added a shower curtain ring for embellishment. The set of curtain rings was new in the box (on an outside table) at a recent local estate sale. I got the set for $1 on the last day of the sale. This popular pattern, "Queen Bess," was introduced in 1946 by Oneida Community with their "Tudor Plate" trademark. It was offered as a Betty Crocker premium by collecting coupons from boxes of selected General Mills products. A vintage ad stated: "Lovely Queen Bess Pattern. Extra heavy silverplate; principal forks and spoons reinforced with additional layer of pure silver. Dramatic new Queen Bess design, inspired by the Garden Rose of China." GOLDEN VALLEY, Minn. — It was the lure of a 10-cent teaspoon (silverplate, no less) that attracted Martha Reuben to General Mills when she was a newlywed more than 50 years ago. She loved the delicate floral spray that graced the spoon's handle. She wanted more. Reuben joined housewives around the country in the 1940s, cutting out Betty Crocker coupons found on General Mill products and sending them in along with a little money to build sets of Tudor Plate Oneida Community flatware. "They were beautiful. It was the Queen Bess pattern," said Reuben, 73, of Dayton, Ohio. "I can remember, I just couldn't stand it until it would come. I would run to the mailbox hoping my spoon or my fork or my knife would be there." 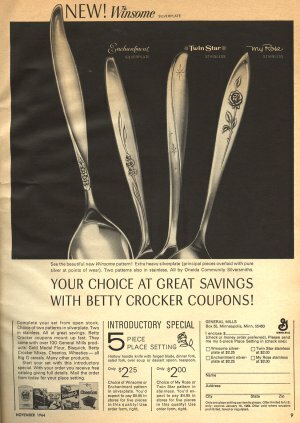 With the support of people like Reuben, who went on to buy multiple sets of flatware for her three children and baby dishes and silverware for her grandchildren, the Betty Crocker Catalog Points program survived until 2006 as one of the longest-running loyalty programs in the country. Blue Ridge China, a colorful series of hand-painted china and dinnerware began in Erwin, Tennessee by Southern Potteries, Inc. in 1920. The plant closed in 1957, yet during those years, girls and women from the hills were trained to freehand paint the hundreds of designs and patterns. From 1920 - 1938, the china was primarily designs taken from sheets of decals, then applied by hand. But from 1938 to 1957, Southern Potteries began adding simple designs by hand around the decals, then did away with the decals and began designing and hand-painting the dinnerware. Southern Potteries was adept at marketing. 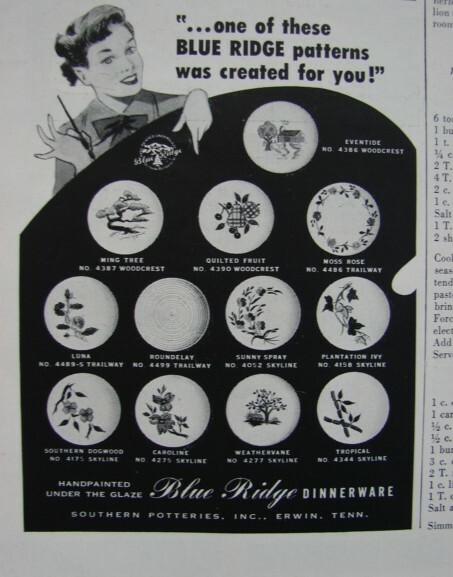 Blue Ridge was used in advertising other products. It was sold by Sears, given away in gas stations and supermarkets. The more unusual the piece (egg cups, relish trays, pitchers, salt and pepper shakers, tea pots, large turkey platters, etc.) can sell for hundreds of dollars. Yet, plates, small bowls, cups and saucers, can be purchased in pristine shape for $15-25 in many cases, and less if showing minor chips or cracks. During the 1930s and World War II years, importing dinnerware from Europe to the U.S. became a difficult task. It was during this era that American manufactured pottery and china gained popularity. Many of the patterns resembled Italian, French and English patterns but were much less expensive and readily available to all parts of the U.S. through catalogue sales and the local five and dime store. Because each piece was hand painted, slight discrepancies within the patterns such as sizes of flowers, embellished strokes and color variations are common. The most distinctive feature of Blue Ridge pottery is the brightly colored one-dimensional floral designs. I included the little ceramic partridge (quail, bobwhite?) below on a whim. She's marked "made in Japan" on the underside. I found her at a local thrift store a few days ago. I was purchasing several items. She didn't have a price tag, so the shop owner said, "I won't charge you for that." I think she looks interesting, but slightly forlorn. Actually a few hours had elapsed since I took the first few photographs. There was a local estate sale I didn't want to miss. Well ... two estate sales. I didn't bring home any treasures, but I did buy an extra plate in a pattern I collect, some books, lots of candles, 3 bone dishes, and some kitchen items. I purchased these Rock Sharpe champagne/tall sherbet glasses at an estate sale. I'll have to remember to show you the matching cordial glasses soon. Will I ever use them? I don't know, but they're adorable! Normally I carefully center the dishes in each place setting. Today I shifted them to the right to allow you to better enjoy the hand-painted designs. These are the luncheon sized plates -- about 9.5 inches in diameter; the dinner plates are 10.5. At what point does recycling flowers from a centerpiece become a science project? This is the third week I've used these flowers (and they were "nearing expiration" and reduced when I bought them!). The arrangements are getting smaller and smaller, but I don't have the heart to throw them away as long as any of them retain glimpses of their former beauty. I was amazed to find these eight five-piece place settings of Blue Ridge dinnerware at a Missouri antiques mall a few months ago. I've been looking at Blue Ridge in antiques shops and malls for years, and I've rarely seen this many place settings of one pattern, particularly not in such good condition. This must have been the rare set of Blue Ridge that was primarly used for display in someone's home. I noticed rim chips on one of the cups and a few minor dots/specks here and there, imperfections in the glaze during the manufacturing process. Blue Ridge wasn't fine china, nor was it ever intended to be. These were "workhorse" dishes. Often the ones in shops have chips, cracks, and/or darkened areas. When I see the ones with crazing and discoloration, I imagine husbands and teenagers coming home late and being told quietly, "I kept a plate of food warm for you in the oven." A nice way to be welcomed home -- but not conducive to keeping dinnerware looking pristine! No spoons in the "spooners" today. This one holds a variety of extra butter knives and spreaders. The salt and pepper shakers are vintage "Cape Cod" by Imperial. I'm using inexpensive lead crystal tealight holders for additional sparkle. They weren't from the "time capsule," but I think they blend well with vintage tabletop items. Now I know why the little bird was looking so miserable ... she was concerned for her babies. They were waiting for me to rescue them from one of the estate sales this afternoon. Do you think she seems happier now? Time to say farewell ... for now. I hope you have a happy Halloween! I've decided to list the Blue Ridge dinnerware used on today's table in my Etsy shop. I might regret it ... when I start packing them for shipping. I promise I'll do it carefully though. Why are they going into the shop? As much as I like them and appreciate their charm (and the fact that they were hand-painted by Tennessee artisans), I'm really more of an elegant china kinda guy. These need to go to someone who will love and use them. You can check out the listing HERE. Please join Susan of Between Naps on the Porch for Tablescape Thursday. Bill such a beautiful table. You know I love Blue Ridge Pottery. I am jealous that you have found complete sets!! This table is a joy to look at. I'm going back for another look!! you are very early with your tablescape. Is the size of the letters as you wanted it? It is difficult to read. But your tablescape is great fun because I remember this time so well. During the research for my book I saw so many of this advertisings of that particular time. They are quite similar to those, you show us. You combined dishes, glasses and cutlery as always in a virtuoso manner. It is a special treat to visit your table. Bill you are so right about the condition of this set. You almost never (but you did) see this pottery in this kind of condition. What a wonderful find you have made. You did a lovely job of setting the table as always. Bill, as always, it is a joy to visit you. I don't know which I enjoy more... looking at your beautifully photographed tablescapes or reading all about the history of the china, flatware, and stemware used in them. You are a master of both! Thank you for sharing your table with us, and I know those dishes are going to find a good home. I can see a collector loving them as they truly are in pristine condition. Hi Bill! Love the dishes! They will find a lovely home. I always learn something new when I visit you! I feel flower arranging is such a gift and it is one of many gifts you have! Have a wonderful week! Avery pretty table as always -- I'm not fond of the 50's style but you did it with elan! A great job as always! I always enjoy your posts. I feel like I have learned something every time I read one of them. Your table setting is beautiful as always. I think my Sister has a set of BC flatware that she collected back in the 60's - need to ask her about that. Bill, what a fabulous table setting - it certainly doesn't look ordinary or every day. I'd hope to be fastened in a time capsule like that one! I love the sweet little birds you rescued, I know they'll be happy in your beautiful home. The Rock Sharpe glasses look a treat, and I like the Blue Ridge plates and super Queen Bess flatware. I think your table and chairs are superb, I haven't seen anything like them in the UK. Thank you for your lovely comments on the 'conkers' - I didn't realise that they're called 'buckeyes' in the US. Stunning. I love that you keep using your flowers. I try to also. Those dishes are quite fabulous, I do like the pie edge. I learned so much stopping in this evening. It's quite nice to have a feast for the eyes and one for the soul as well. Great job mixing all the pieces because it looks like it was meant to be! Hi Bill, its first time that I visited your blog and first time a MAN'S blog :)... beautiful and stunning, first of all I loved the detailed photography, its very beautiful, I dont know from where to start... either I love the crockery, glasses, candle lights, little add ons, votive candle holders . the list will be going on and on... Its more than beautiful.. SIMPLY.... I am going to follow you now..
Beautiful table...Blue Ridge pottery can't be mistaken for any other kind, it is just so distinctive. Your crystal sparkles like diamonds sprinkled on the table. Thanks for sharing. You really cracked me up with the baby birds. And she DOES look happier now. The shower curtain rings were genius. I'd never have thought of that! I love what you did with the Sundae glasses. I'll have to remember that one! What a wonderful visit down memory lane. You have taken your "work horse dishes" and created such elegant place settings just using pure simplicity. I remember Mom scrambling to save the Betty Crocker coupons for silverware. Looking back I believe we dubbed that era the Thrifty Fifties. Thank you once again for the lovely visit and all your inspiring ideas. This was truly a history lesson as well as a fun tablescape. I'm not familiar with the company that made the dishes, but I certainly remember when people cut the Better Crocker coupons off of things to send in. My mom was more into Green Stamps, but she would save the Better Crocker coupons for her friends. I hope your dishes find a great home! This time travel piece is such a fun idea!!! I can actually remember collecting Betty Crocker stamps or coupons toward to use to get flatware!!! That really dates me! :-( What a clever use of a gorgeous shower curtain ring!!! Candles are nice for brunch when the skies are cloudy and the room is kind of dark like so many days in autumn and winter. Have a great week/weekend/Halloween! Bill, I learn so much every time I stop by your blog. Your table is just beautiful as are your photos. Hi Bill, what a fun posting. I couldn't believe "my era" looked so nice. It is so funny, I bought the same quail this summer at an antique shop, there is the label which says Homco made in Japan under each quail. I bought the daddy size, mama size, and a baby size. They look so nice with the boxed set of four piece place settings of white ironstone by Johnson Brothers made in England 2C which I found in another shop that was still in the sealed box with a Green Stamp label glued on the box top for a receipt. Those dishes have a pretty square bowl with each place setting. I would love to find four more place settings like those. I purchased many items using Green Stamps and Buckeneer Stamps, but I remember my Mother saving the Betty Crocker coupons. When my youngest son was visiting me a while back, he said "Mom is that the duck tureen that we got with Green stamps?" Yes it was, nice memories. Thanks for your work posting such beautiful tablesettings on your blog. Beautiful! I have a set of Betty Crocker silverplate that was my mom's. Love the shower curtain hooks! Bill, Again you gave me another history lesson on china! I love reading all of your descriptions and history of china patterns, silver patterns and glass patterns! This is truly an American History lesson to appreciate! Love seeing that cutlery ad--twin star pattern is what I grew up on; my sister got the rose pattern when she got married and we all collected the B.C. coupons and mailed away for our place settings little by little. Memories! Thanks for sharing another beautiful table with your followers! What a wonderful collection of dishes someone will get! I love this -- but I think my favorite is the mama quail and her babies! I remember that pattern on the flatware. My mother loved to send for these things and to save the stamps at the grocery store for the china. This brought back lots of memories. I love your new Tablescape, with your lovely dishes and glasses. You know just how to put it all to together. Your table looks so good, you must have a lot of dishes to work with. I appreciate you sharing with us. Very nostalgic. I love all of the crystal. My mother has some of those same pieces. I never, in a million years, would have thought of using SHOWER CURTAIN RINGS on napkins! How original & creative...they look wonderful, too. The "Queen Bess" flatware pattern is very similar to my "Always"/"Wedgewood" pattern in the floral motif but it is positioned in a different spot. I had to get up & go look to make sure! I have never seen that pie crust edging on dinnerware but I sure do remember my Mom getting dishes & glasses at the gas station & inside of boxes of detergent. I did the box top/green stamps thing myself....YEARS AGO! I immediately noticed that you had off-set the plates & I think it adds an interesting dimension. You're always thinking outside the box...just a wee bit quirky, you are! Always an informative & inspiring visit. Thank you for sharing your wealth of knowledge & talents. What a great job you have done again. My grandmother used the coupons to order silverplate and I still have some of it. What a beautiful table, as always. I always learn so much from your posts; I enjoyed reading about the Rock Sharpe crystal. Your posts are always so interesting and photographed so well. It's a pleasure. I can't believe how new that china looks. I agree with you that it must have been used for display only. I love etched crystal too. Doesn't matter what pattern. What a beautiful table! I have some of the Blue Ridge and just love it. How great to find some in such wonderful condition! Thanks for including the vintage ads-they are so interesting! Another wonderfully educational post, Bill! I feel as if I'm taking History 101: The History of Tableware -- and I love history! I especially liked the look of the forks in the sundae glass and the "science project" flowers in the purple jug! As always, I LOVE your table. It is so wonderful to see the pictures, I feel like I'm there. You are so lucky to find these fabulous things at estate sales, lucky us, we get to see it all displayed beautifully. And how clever to use curtain hangers, they are so pretty, I'll have to make a trip to the hardware store soon. Hi Bill, Thanks for another wonderful history lesson! I just love reading your post...the plates are very pretty and loved your estate finds. Lovely table, Bill. You did such an awesome job on it..and your photos are stunning. I was a teen in the 50's and I have sure been wondering why my mother didn't have such lovely dishes and glassware. I am sure it was because she could never afford the nicer things. Quite often, I am hungry for a bowl of sweet rice, with butter and a tiny bit of milk, with a slice of oven toast..my number one comfort food. I wish she knew how much I loved her "stretch it" meal...but the good thing....she knew how much I loved her. Bill...what fun and lovely tables. This mid-century table is so familiar in my memory. 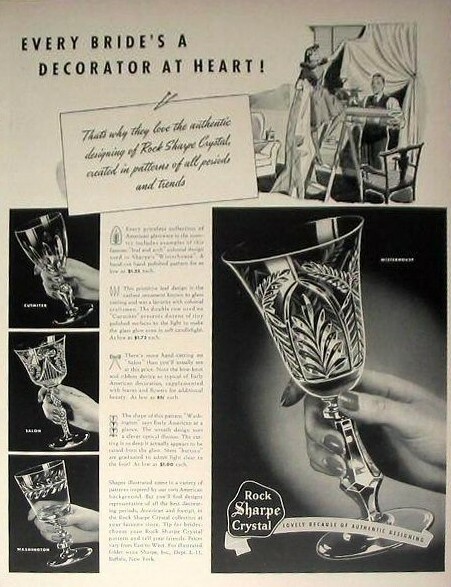 Your ad shows the Twin Star flatware that was my Mom's (BC coupons were always saved in our home) and the Blue Ridge dishware is very similar to some my grandma had. Ahhh, Bill. It is always such a delight for me to see one of your tables. I so enjoyed seeing the old advertisements. It makes me think that maybe my grandchildren (hopefully I will have some one day) will enjoy the photos I have of my tables. The dinnerware is so beautiful but it is your presentation that really brings out its beauty. I especially like your night photography - such a magical glow and sparkle. What a fabulous table! I so enjoyed reading about your dinnerware and crystal. Just a gorgeous tablesetting. *Love the vintage ads. LOL on the ads when he calls her "Madame". It's interesting to see the hand model as well-who would have thought they used them back then? And the spoons, I remember them so well. 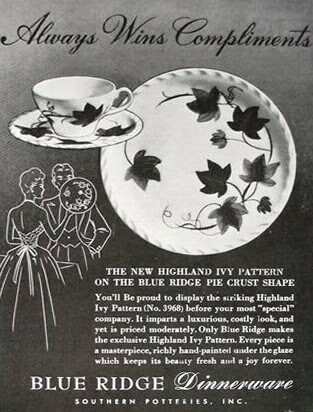 *I like the way you displayed the Blue Ridge china showing the pattern. It looks fresh and more interesting that way as well. *Where do I begin to tell you how much I love the tulip shaped sundae glass used as a spooner? My mind was instantly transported to a gorgeous Christmas buffet filled with sparkling crystal and tulip shaped sundae glasses filled with silver flatware along with great food, candles, etc. I think though I'd have to try at least one sundae in the glass. I imagine a scoop of homemade vanilla ice cream with a rhubarb glaze over it and a mint leaf for garnish would be lovely. *As for elegant china, I couldn't agree more. I love bone china and used to lose myself in Marshall Fields when I was in college a very long time ago, going up to the floor with all of the fine china (they had awesome displays) and imagining what it would be like to own so many beautiful sets. Of course, there were so many I loved! On a side note, I purchased a full set of some porcelain china for tablescaping however I've never used them since I can't get into porcelain-the crisp white colors of the bone china and the perfection of it all is intoxicating. *On the flip side, I think your Blue Ridge china would look amazing in a contemporary dining room setting. I imagine it with one of those brown wood, woven type runners and perhaps some of the same/similar type placemats. I think pairing it with chocolate brown would be stunning. *And finally, love those vintage Cape Cod Imperial Salt and Pepper shakers. They look so elegant. Another fabulous week as usual. Sorry for writing a book-my comment looks a bit overdone now that it has printed, lol. Hey, bro! How ya doin'?! LOL! Seriously, I am LATE this week in commenting, I haven't been online that much. But, regarding your tablescape, what else is new? It's gorgeous, as usual!!!!!! I love the glasses, and I particularly noticed the pretty tealight holders you used, plus the elegant salt and pepper shakers. You always come up with some new, interesting things for us to notice, my brotha! Lovely table,dear Bill! Your photos are stunning! I inherited the Queen Bess silverplate from my late Mother and I have added to the set through e-Bay. When I use the silverware I feel I am honoring her. I just adore your blog-it is so informative! Hi, a bloggy friend referred me to your blog, because of a post you did on Blue Ridge tableware and I think I've found it!. It was interesting to read the information you had on the history of the Southern Potteries and to see the ads. I'm trying to find out more about the other potteries that employed ex Blue Ridge artists (Stetson, etc.) . You have a wonderful blog and I could spend hours on here. Just found your blog today..The BC ad of flatware looks like the flatware my dear MIL ordered one year from Shell Oil for me, and my two sisters-in-law. I've been trying to find out the pattern name through replacements.com out of Greensboro, NC but you have to take a picture of front and back and send to them. I haven't done that yet. The pattern on the far right with single rose looks so similar to mine but I couldn't read the name of the pattern off the advertisement picture. Would you be able to read it off and perhaps post it on here? I would be so appreciative. I went to my silverware drawer to doublecheck the pattern. I noticed on the knives, the rose is facing a different direction than on the forks and spoons. Never noticed that before. The end of the silverware shown in the advertisement seems more pointed than mine. I remember those BC catalogs and wonder if they still offer them or the merchandise. I recall ordering something from them before and the last time I got a catalog, the prices seemed quite high. We have so many shopping centers in our area, that you can hit sales and do much better in price, plus don't have to pay shipping cost on the merchandise. I will go on the General Mills website just to see if they still offer the BC catalog. I think the last time I requested it, they were even charging for the catalog but would deduct that price if you ordered. Love this blog..discovered it today through Bill at Affordable Accoutrements. Have to call a friend because I saw her everyday dishes on another blog. Earthy Meets Ethereal -- Does it Work?